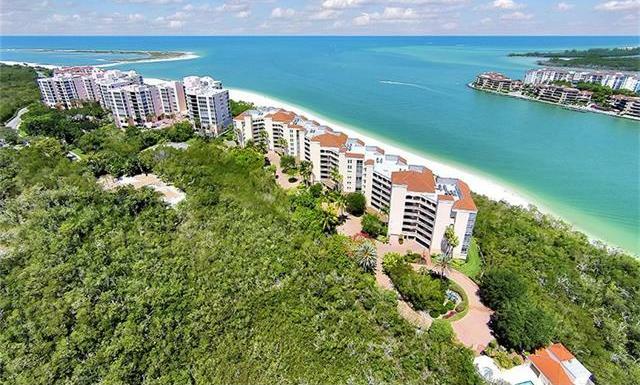 **ONLY ONE RENTAL PER YEAR 3 MONTH MINIMUM** Enjoy this beautiful 2 Bedroom, 2 Bath plus den condo on the 5th floor nestled within the Hideaway Beach private community. The views from this oversized lanai are spectacular! Enjoy magnificent sunsets! The Royal Marco Point III condominium is 7 stories with 78 units. With its own private pool including lap pool area & spa. The pool building with showers & lounging areas. Enjoy 9 Hydra-Grid Har-tru tennis courts, Club house, three restaurants, one of which is next to the Club pool and spa, with shower room and locker facilities. The Sunset Bar and Grill overlooking the pool and beach. There is a 9 hole golf course; A Sports Center building with a large wrap-around balcony that overlooks the tennis courts and golf course and a pro shop. There is a Croquet Club and field, a large exercise facility and massage facilities and steam rooms. BBQ area. Driving cage, putting green, shuffleboard & croquet field. 24 Hour manned entrance gate.